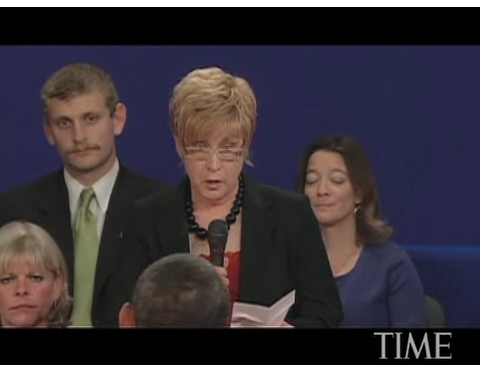 Last night, while watching the debate and furiously taking notes so I could put together a three-minute version of the event for TIME.com, it occurred to me that I found the questions more compelling than the answers. Because this was a town hall style debate (though, since the campaigns had tied it up with a bunch of rules, it wasn’t as free-form and open as a normal town hall), the questions came from audience members — some 80 undecided voters from the Nashville area — and a selection of ones from the Internet. Debate moderator Tom Brokaw chose the questions from among thousands. As I ate delicious home-cooked food and watched with my debate pal “kal,” we determined that the questions from these voters gave us more hope for America than the practiced speechifying of either candidate. Here were thoughtful queries from people legitimately worried about the country and its direction. I decided I should see what would happen if we strung the questions together in one piece. Kal said it could be put to some piece of rock Americana, like Bruce Springsteen or John Mellencamp. “It’s guaranteed to go viral,” she said. This morning, I asked producer Vanessa Kaneshiro to put the piece together. It’s not set to music, but it does carry a tune. The results are here. Ain’t that America? Somethin’ to see, baby. I enjoyed the way you captured the humor in the final moments where Brokaw’s view of the monitor ( a very werious set design error) made both candidates think. I also, thought, how many more questions could have been answered?, if the terse answers only, were given.